Big, honkin’ cars are for the 1930s, but ruby necklaces are forever. The Carmen Sandiego franchise was the premiere edutainment video game series of its day. 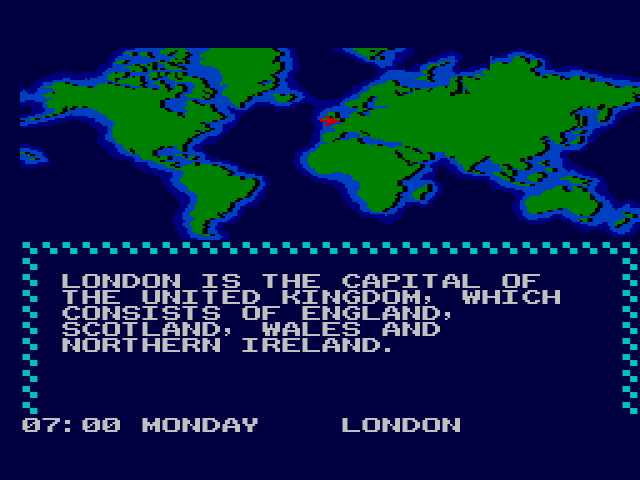 First released in 1985 for various home computers, Where in the World is Carmen Sandiego? thrust players around the world in search of treasure-snatching thieves. The ultimate goal is to capture the world’s most elusive thief, Carmen Sandiego, though you’ll only get the opportunity after arresting a couple dozen of her gang. By searching different locales – libraries, embassies, sports clubs, etc. – within the cities of the world, one obtains clues to discover both the identity of the thief and the location of where they’re headed next. Many of the clues center around the country itself: the geography, colors of the flag, landmarks, etc. Figure out even one of the clues and you’ll have a good idea of where to go. Eventually, after discovering enough information about the perpetrator, you make a warrant for their arrest and continue to chase them. Find them, and the cops will make an arrest. Hearty jail-time for them and a big fat promotion for you. 7am is too early for a history lesson from a flight attendant. 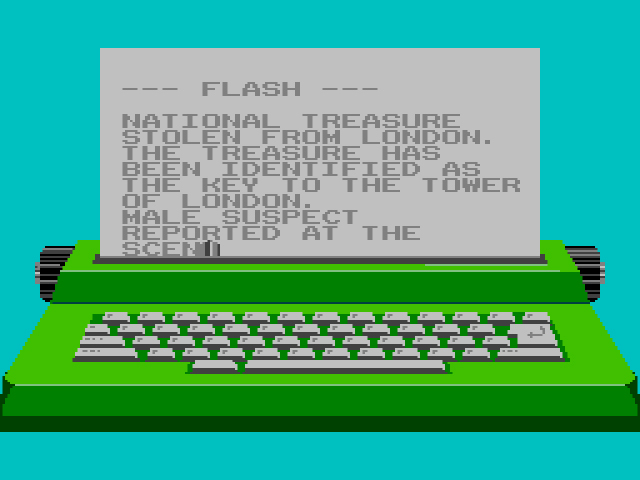 Later Carmen Sandiego games would introduce time-traveling elements (somebody stole Mozart’s piano! To Austria, 1772!) or confine you to the United States or Europe only, but they all follow a similar formula: gather information about the bad guy and his whereabouts, follow them to their next location, secure warrant, arrest. This formula is surprisingly addictive, particularly if you have any interest or knowledge of world history/geography. Not only do you learn about different countries/states/time periods as you play, but each capture gives an enormous sense of satisfaction. The perpetrator could make a break for it, but he doesn’t want the police to look stupid. Where in the World is Carmen Sandiego? for the Master System makes some stylistic changes, perhaps to make the game more digestible for console gamers. First, you choose your rank: Rookie, Sleuth, Private Eye, Investigator or Ace Detective. Obviously, the higher your rank, the more difficult your cases will be from the start. In the computer version, you always start a new game at Rookie, so as to ease you into the gameplay. You’re then given a case. Fly to the city where the crook was last seen, then search for clues. You’ll know you’re on the right track if a henchman appears and launches a knife or two at you. In the Master System version, you actually control your gumshoe around the city. In the computer version, you don’t control anyone manually. Rather, you make all decisions – to fly, talk, explore the surrounding area – from the first-person interface. The passage of time is important to both computer and console versions. You’re given about a week to solve each case. When you enter into a building in the city and talk to a person for the first time, you only lose one hour. But you’ll lose two and then three hours when you enter into the second and third building, respectively. Issuing a warrant takes three hours time. Getting hit by a henchman’s flying knife takes off two hours, while a bullet takes four hours of recovery time (this particular loss of time is only in the Master System version). You sleep nine hours a night (that we could all be so blessed). Flying time depends based on how far you travel. Some crooks like to stay within the vicinity of the crime whereas others spread their wings and zigzag across the world. Plan your time accordingly. Listen anonymous narrator, give me Rome’s life story later. I got a case to solve. There is no real action in the computer version of Where in the World, only crime solving via the first-person interface. In the Master System version, there are limited actions. Your gumshoe is equipped with a jump in order to avoid the henchman/thieves’ flying projectiles. Also, when you find the thief, they are not automatically arrested as they are in the computer version. You have to linger on the screen where they’re located and avoid their bullets until the cops show up and arrest them. Get too close to them, they’ll run away, and you’ll have to wait until they emerge from off-screen again. If you’re low on time and you get hit by a couple bullets, this “showdown” with the thief will be doubly frustrating; particularly since you’re unable to protect yourself. And really, why are the thieves – thieves, not attempted murderers – shooting at you? Sure, maybe other thieves unaffiliated with Carmen Sandiego and her cronies would sling some bullets. But the franchise has always been about making clean, safe arrests, not brain-dead gunplay. The Master System port plays more or less like Carmen Sandiego, but it doesn’t feel like Carmen Sandiego. 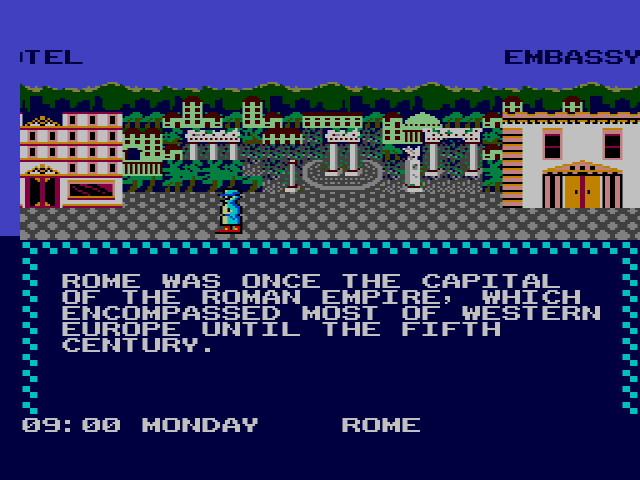 I grew up playing the Commodore 64 version of Where in the World with my grandfather. The game was brilliant and mysterious. Particularly at the time, I had never played anything like it, nor was there anything close to it on the consoles. I loved the picturesque snapshots of all the different countries of the world. I loved the interface: everything you needed to complete a mission – investigating the city, making a warrant, and flying around the world – were all displayed right in front of you. The C64 version also came with a thick book called “The World Almanac and Book of Facts” that we used liberally to help us figure out the clues provided. No “Book of Facts,” I tell you what. Perhaps I’m too jaded to appreciate changes to a beloved franchise or perhaps I loved learning about Peru, San Marino, and Namibia with my grandpa. Either way, the Master System port feels inferior to the computer version. The switch to the side-scrolling perspective on the Master System has you controlling the gumshoe rather than inhabiting the role of gumshoe. A silly difference for some, but I always loved feeling like I was the one solving the cases. 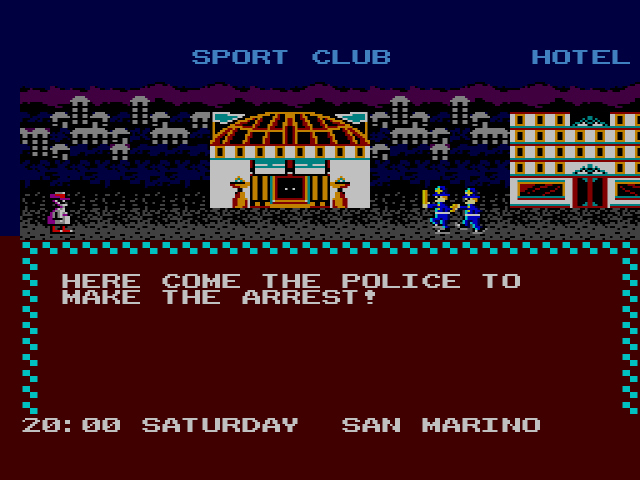 With the Master System version, I’m controlling a trenchcoated bootlick who happens to be good at solving crimes. 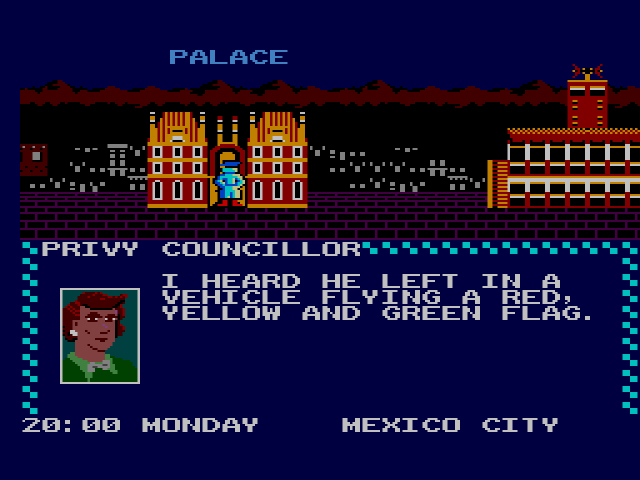 The background graphics for each city are a marked improvement over the washed-out snapshots of the C64 version in particular, but the limitations of the C64 provided a mystique that the Master System version lacks. The half-hearted action feels tacked on, unnecessary. Bad guys shoot at you in every other game, not Carmen Sandiego. Where in the world is Carmen Sandiego? Forever in my heart, if not my Master System. Well said, and it explains just why the NES, Genesis, and Super NES versions (all by different publishers) of the Carmen Sandiego games stick with the computer interface. Oh man, classic! I had Where In Europe? back in the day and played the hell out of it with my brother. I see what you mean about not “inhabiting” the role of the gumshoe, but to make it palatable for the console crowd, perhaps the rudimentary platforming was necessary, like you suggest. Think, though, about how clunky a menu-based interface would be on a console of this generation. Sure, Shadowgate and Deja Vu for the NES were fun, but getting around seemed to take forever. The menu-based interface would have been clunky, but dammit, it would have been honest. Didn’t they have a Carmen SanDiego cartoon? I seem to remember it. I imagine Parker Brothers was looking at computer games that were popular and said how can we make it appeal to console gamers. Hey better graphics. How about some rudimentary action! Ok make it happen. Those aren’t nessecarily bad ideas. Honestly I’ve only played the computer version in school. Carmen Sandiego had a cartoon, and an amazing PBS show in the early 90s. Surprisingly great stuff there. Really, the series should have stayed on the computer where it belonged. Also, I should have specified that the Carmen Sandiego thieves were less about violence; at least as they were portrayed in the original games. The Carmen Sandiego cartoon aired starting in 1994, right as the PBS show (which, as Dylan said, was brilliant) was starting to wind down. I haven’t seen the show in probably like 20 years but I swear I can still sing the entire theme song back to front. It’s stuck in my head right now! Gah! Also, looking at the game list, this is the last one for 1988? Congrats on getting through a full five years of Sega! Yes it is! And thanks! The next five years will take much, much longer. Looking ahead, it’s a good thing you already reviewed High-Tech World, if you had to do that and ALF back to back, it might have driven you to quit.